Considering Saul Goodman will one day tell Walter White that Gus Fring is a friend of a friend of a friend, I had been wondering if Jimmy McGill would cross paths with Gus in any way, shape, or form this season on Better Call Saul. Their encounter in Los Pollos Hermanos might qualify as fan service, but it was executed so perfectly through Vince Gilligan's direction that I found myself on the edge of my seat waiting to see if the encounter would happen. And I was not disappointed. For anyone who has been paying attention to press regarding this season of Better Call Saul, you knew the return of Breaking Bad's greatest villain was imminent. But the teases throughout the episode - the shots of what was clearly a Los Pollos Hermanos restaurant during Mike's stake out, with Gilligan refusing to show us the sign until the last moment, watching Gus sweeping the floor in his familiar uniform but with his face away from the camera - heightened the tension in a manner I didn't think the show could pull off. After all, most of the audience knew the big reveal was coming. Yet, it was still exciting. Heck, most of the audience knows what will eventually happen to Mike and Gus once they cross paths with Walter White in a few years (and everyone knows what will happen to Jimmy, thanks to the Omaha flash-forwards). Yet the tension was still there throughout Mike's investigation. We also know that Gus is on the other side of that cell phone at the close of the episode, yet I'm still excited to see how the Mike-Gus relationship begins. It's a testament to Gilligan's direction and Thomas Schnauz’s script that everything within the Gus Fring reveal worked so well. 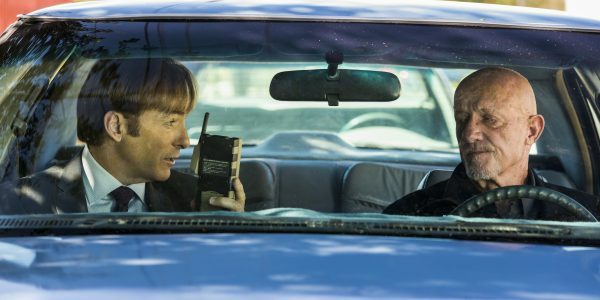 [caption id="attachment_95300" align="aligncenter" width="600"] Bob Odenkirk as Jimmy McGill, Jonathan Banks as Mike Ehrmantraut Photo Credit: Michele K. Short/AMC/Sony Pictures Television[/caption] But enough about good old Gus. The major thrust of the episode was Jimmy McGill once again falling prey to his impulsive nature. Chuck's plan worked like a charm (although it took about eight days longer than he originally thought it would, thanks to Ernesto being scared to reveal the information). While we all know that Jimmy must, eventually, turn himself into Saul Goodman, it was still hard to watch him ignore Kim's statement that everything will be ok and simply fly off the handle without taking a moment to think. Everything Kim said and did was correct. The tape was useless to Chuck. Yet Jimmy's action turned it into something that can get Jimmy burned. Heck, it could get Kim burned depending on how Chuck uses Jimmy's outburst to blackmail him (as sending Jimmy to jail for the damage he caused isn't a good storyline for the series, I'm guessing Chuck will extract some promise from Jimmy in return for dropping any charges). The confrontation with Chuck really drove home the point that Saul is on his way, and I'm surprised how sad that makes me. I've really come to enjoy Jimmy, something I didn't think would be the case when Better Call Saul began. But with Jimmy making impulsive decision after impulsive decision (confessing was just plain stupid, even though I can certainly understand wanting to trust a sibling and prove your worth to him), it's clear that his existence is slowly coming to an end. After all, Saul Goodman doesn't let ethics stop him, and he certainly won't get fooled by something as mundane as a tape recorded confession. I can't wait to see how Jimmy's spiral downward continues. 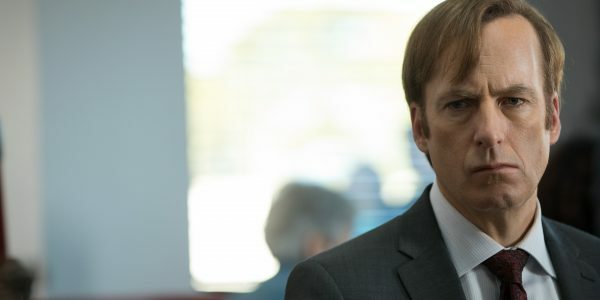 [caption id="attachment_95299" align="aligncenter" width="600"] Bob Odenkirk as Jimmy McGill - Better Call Saul Photo Credit: Michele K. Short/AMC/Sony Pictures Television[/caption] Final Thoughts: -- The "Give me a dollar." trick to establish attorney-client privilege is absolutely something attorneys do. I was glad to see Kim pull it with Jimmy, especially because it netted her a $20. -- That person in the SUV peeling out of Los Pollos Hermanos? Victor, one of Gus's lieutenants from Breaking Bad. You might remember his death at the hands of Gus and a box cutter more than the character himself. Also interesting? Mike becomes his boss at some point, despite Victor clearly working for Gus longer. I'm sure there won't be any tension there. -- Also making their first appearance? Francesca, who will continue to be Saul's secretary in Breaking Bad. -- I have a feeling this was the only time we'll see Gus and Jimmy interact, as Breaking Bad clearly established that Saul didn't personally know Gus. Saul also didn't know that Mike was a high ranking member in Gus's organization, so that's another dividing line the series will have to keep intact moving forward. -- Since it needs to be said, Chuck is such a jerk.